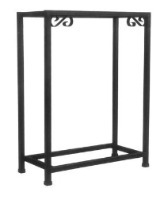 10 Gallon Fish Tanks & Aquariums (& Stands!) | FishTankBank. Our collection of 10 gallon fish tanks and aquariums is one of the most comprehensive (and varied) on the internet. 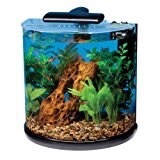 We've searched the web to bring you the very best collection of 10 gal tanks out there, both glass and aquarium, and we've also included a variety of different designs and features, as well as kits (which are perfect for beginners) and stands (which are perfect if you want to show your fish off). It's important to note that these aquariums aren't exactly massive - in fact, we'd only recommend this size of aquarium for very small fish. We can also provide custom aquariums in these sizes. 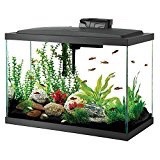 What are the best fish for a 10 gallon fish tank? There is not a huge amount of space in a 10 gallon tank, so you need to make sure that you choose your fish wisely. 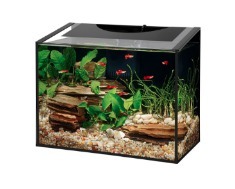 Generally the best fish for an aquarium of this size are fish like Danios, Tetras and Guppies. I would go as far as saying that any peaceful fish between 1-2 inches in length would be suitable for a tank of this size. You could keep 3-4 fish in the tank at this size. If you're wanting more fish, I'd recommend a 30 gallon or 20 gallon. What equipment is needed and what is the best setup? For most 10 gallon tanks, you'll need a filter, heater and lights. Most tanks in this list are starter kits, so they come complete with quite a lot of this equipment. 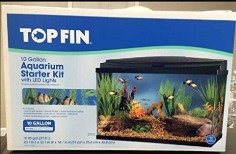 If you're a beginner and you're still learning about keeping fish, then I'd suggest getting a starter kit. 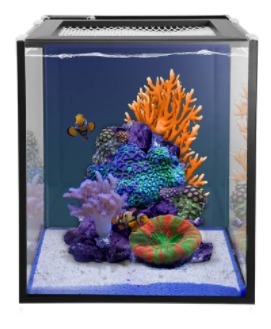 We don’t feature fish tanks from Innovative Marine on our site very often, which is a shame really as they make some seriously interesting and cool aquariums, like this 10 gallon variety of their Nano Fusion tank. Aside from looking cool, the tank has a bunch of useful features that make it a great choice for beginner and intermediate fish keepers, including: High clarity low iron glass, built in overflows, filter sock. 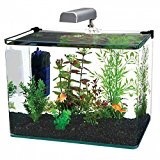 This 9 gallon fish tank kit isn’t just designed to keep your fish safe and happy, it’s also designed to support the growth of plants. It has a powerful 7500k LED system which will ensure the plants stay healthy and continue to grow long after you’ve placed them in the tank (and the system comes with a remote control). The aquarium also has a bent glass design similar to other tanks in this list, providing a unique viewing experience and creates the illusion that everything inside the tank is larger than it actually is (so don’t be alarmed if your friends think you’ve got a shark in your tank). A nice feature of this tank is that the lid is very simple to remove, despite the complicated design. The filtration system is in the back of the tank, and has plenty of room for a considerable amount of filter media. 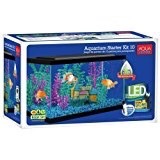 This is another Aqueon 10 gallon aquarium, this time from PetCo. It has black rims and is currently on offer over on PetCo. The reviews for the tank are overwhelmingly positive, with many Betta fish owners saying that their Betta really loves the tank. If you’d like to learn more about this product, please feel free to visit PetCo through the link below. 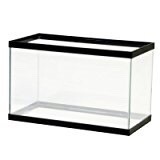 This is another Fluval Edge aquarium, and again it’s available through PetCo. The product has an average rating of 4 stars from more than 40 reviews, which is very high. One of the coolest features of this tank is it’s 3 position switch, which allows you to choose between different lighting settings – bright daytime, deep blue nighttime and completely off. It also comes with handy features like low voltage power (to save energy) and 3 stage filtration. It’s ideal for the home or even the office, check it out below. 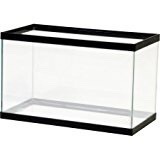 This 10 gallon aquarium from Aqueon has 2 purposes – to look great and to provide a comfortable environment for your fish. Made with high quality glass and fitted with QuietFlow filtration, it’s attractive enough and subdued enough to sit within a bedroom or an office. The tank is fitted with concealed LED lights which add to the calm and collected feel of the tank, hopefully keeping you (and your fish) really chilled out! How many fish could I put in my 10 gallon tank? Generally, the rule of thumb with fish tanks is 1 inch of fish per gallon of tank, so with only 10 gallons there isn't masses of room for fish here. Ensure that you're leaving plenty of room for your fish to be happy and healthy. The best fish for a tank with these dimensions would be a guppy or a betta or something similar.